“Guns. Lots of guns.” Who can forget this iconic scene from The Matrix? 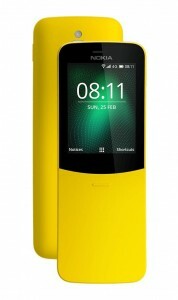 Neo used a Nokia 8110 to make that call, which gave the banana phone a cult status. No need for nostalgia, though, HMD is in the business of resurrecting legendary Nokia phones – allow us to introduce the Nokia 8110 4G. It features the iconic curved design and even has a tongue-in-cheeck Banana Yellow color option, the more serious one being Traditional Black. And it’s the first phone to have a slide-down cover since… forever! It is not spring-loaded, though, which makes it more authentic (the original wasn’t either). The slide offers the long-lost tactile feeling of answering or ending a call. You can’t angrily hang up by poking at a touchscreen, but you definitely can with a slide you can slam shut. It’s no longer based on S30, instead KaiOS was used (which was forked off Firefox OS). This brings the old-time favorite to the 21st century with some Android smarts. You get Google Search, Maps and even the Assistant! And you get to sync your contacts and calendar with your Google account, so much more convenient than the old days. 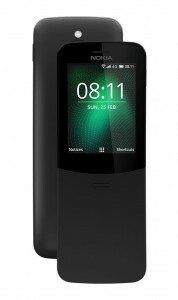 You can’t get into the Matrix with this one, but the Nokia 8110 4G will get you on Facebook and Twitter. There’s no selfie camera though, so if you want to update your cover photo you’ll need to use the 2MP camera on the rear. In terms of other apps, more are being developed, but you shouldn’t expect miracles as the phone is powered by a Snapdragon 205 chipset. That’s still more than enough to run the revamped Snake game on the 2.4” curved display (QVGA resolution). And, as the name suggests, there 4G LTE connectivity – both for VoLTE calls and for a Wi-Fi hotspot. The 1,500mAh battery will last over 9 hours of VoLTE calls or 48 hours for music (you listen through a 3.5mm jack). There are single and dual-SIM versions of the phone. 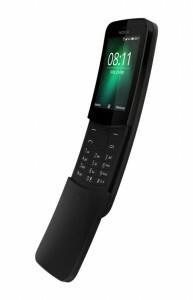 The Nokia 8110 4G will cost €80 when it becomes available in May.